Fishing Oklahoma lakes, rivers, and ponds is a favorite Oklahoma past time. In addition to the many area lakes, Oklahoma is home to many excellent fishing ponds. The ponds are typically on private land, and require permission to fish from the owner. 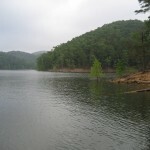 Lake fishing in Oklahoma is great, and most are accessible to the public. Largemouth bass can be found in nearly every lake in Oklahoma. For the striper fisherman, Lake Texoma striper fishing is unbelievable, and you may catch a trophy striper at the Lower Illinois River. There are many other species of fish available in Oklahoma, below you will find the most popular ones for fishing. So pack up the car, grab your fishing gear, and visit a Oklahoma fishing spot today! Check out our list of Oklahoma fish species below, click on the link to find a list of locations to fish for that species. If you have pictures of any of these locations and would like us to post them, you can upload them on any of the pages below. Or email them to us at photos @ outdoorsok.com. Also Check out the Oklahoma Fishing Forum where you can discuss or ask questions about your favorite Oklahoma trail.